3. There is an amazing amount of diversity in the cast. I have never seen such a wonderful melting pot - men and women, old and young, every color and religion you can think of, and what a fantastic representation of the acceptance and embrace of cultures seen all over the U.K.
4. They aren't typecast like they would be here in the U.S. There's no bitchy girl, no entitled douche-bag of a guy, no sluts or players, no gangstas or wannabe rap stars, no overly-conservative woman of faith to clash with the the sluts and get played by the players, no accelerated drama encouraged by the clash of personalities. 5. They're nice to each other. This is one reality show where they all treat each other with charm, good humor and civility. No one talks smack or tries to sabotage anyone else. Whenever someone is eliminated, they all gather around for a group hug, and when someone is crowned this week's Star Baker, they all cheer and hug the winner. At the finale, no cast members are brought back to talk trash about the two finalists - on the contrary, they throw a garden party instead and invite all the contestants and their families and it's a wonderful time. 6. The setting. Filmed in the lush green gardens all over the UK (such as Welford Park in Berkshire, Valentine's Mansion in Redbridge and Harptree Court in Somerset), it's always green, the flowers are always blooming, and even the rainy days look beautiful. The bakers are set up in a large tent with clear-paneled sides, so the environment definitely adds to the charm. 7. The Hosts. First, we have the grand maven of British baking, Mary Berry - she's like the Julia Child of cakes and she's perfectly and absolutely lovely in every way. And she adores it when they bake with alcohol! Next, we have the steely-blue eyes and mild Scottish burr of Paul Hollywood (yes, that's his real name and its roots go back centuries in Scotland, thank you), who's a celebrity chef and TV personality in his own right. They're joined by producers and co-hosts Mel Giedroyc and Sue Perkins, whose snarky commentary keeps everything perking along. 8. The structure of each day's challenges. 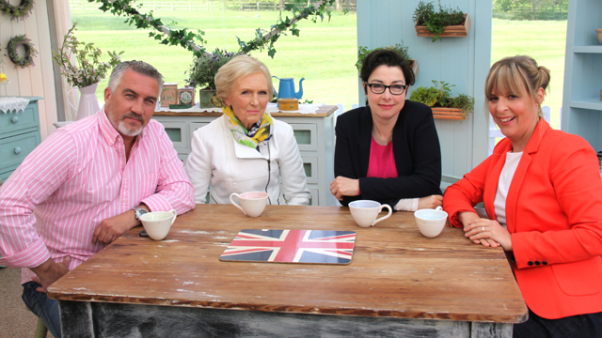 Each episode features three challenges: The Signature Challenge, where bakers show off their tried-and-true recipes that they make for friends and family, the Technical Challenge, where they receive a recipe from Mary or Paul's collection (and the recipe is always vague on certain parts to test their baking skills - for instance, it might say 'proof the bread' but it won't tell you how long to proof it, or it will tell you to add sugar to the pastry layers but it won't tell you when in the recipe or which layers it should go between), and finally, the Showstopper Round, where the bakers really get to show off their creativity with both flavor and design. It's amazing to watch it all, it really is. 9. All the new ways to use words. I find myself calling things "scrummy" just like Mary, or raising my brows like Paul and saying "You're going to go with that?" whenever one of my kids has a wild suggestion. I call food lovely all the time now, or remark that someone's being "brilliant" without a hint of sarcasm. Why, I sound positively, very nearly, almost British. And I am gobsmacked by it. 10. The food! Oh, the breads! The pastries! The breadsticks and biscuits and steamed puddings and cookies and the cakes! Oh, my God, the cakes! I leave each episode hungry and with a driving need to be up to my elbows in flour. I've learned to make homemade biscotti, a really decent loaf of chewy, rustic bread, and a scone that would make your eyes roll back in your head. My scale may not thank me, but my tummy and my friends sure do! If you haven't watched this yet, you need to. One episode will have you sipping tea and feeling quite lovely.